My Low Carb Keto Waffles recipe is simple to make and without any fuss! No need to whip the egg whites, just mix the dry low carb waffle ingredients in one bowl and the wet ingredients in another then blend them all together, that’s it! 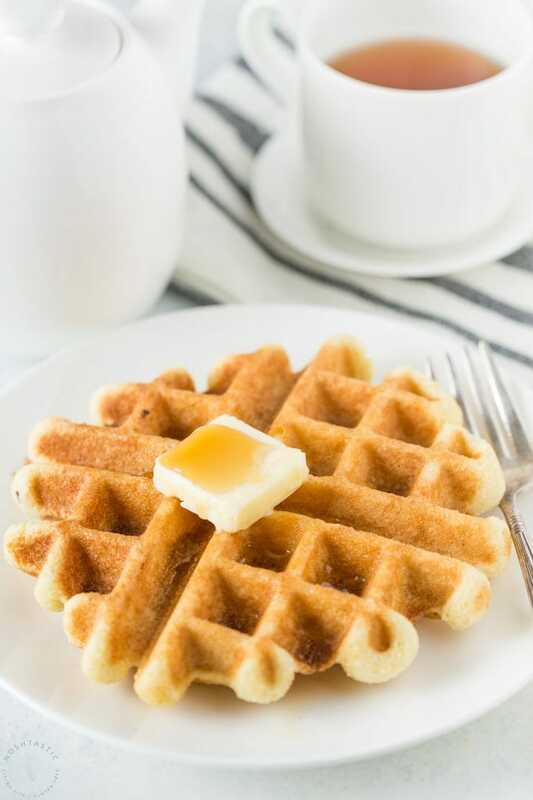 My Almond Flour Keto Waffles recipe are a healthy way to start the day, my kids love them and they usually make and cook them a couple mornings per week. These waffles are pretty filling as they are made with almond flour, the net carbs for one fourth of a waffle is approximately 2g net carbs per serving so even if you eat a whole low carb waffle it’s still only around 8g net carbs and you’ll be full for a very long time! In order to make this low carb waffle recipe you’ll need a few simple ingredients that you can find in most grocery stores these days. The first and most important is fine ground Almond flour, this provides the structure for the waffles. So first of all you’ll need to measure out the fine ground almond flour, baking powder (not baking soda), Xanthan Gum, low carb granulated sweetener and mix well. Then add the eggs, vanilla extract and water in another bowl and beat until well combined. Plug in your waffle iron and let it heat up, then mix the wet and dry low carb waffle ingredients together really well so that there are no lumps. Once the waffle iron has heated you can grease it with a little melted butter or coconut oil and then add about half of the Keto waffle batter to it and smooth it out just a little with a rubber spatula. I find that these waffles take a little longer to cook than regular waffles, about 5-6 minutes but the timing will vary depending on the heat of your waffle iron. These keto waffles will be much softer and more fragile than regular waffles when you go to remove them from the waffle iron, this is normal so don’t panic. They will firm up a little bit more as they cool but they do not get crisp like regular waffles due to the almond flour. 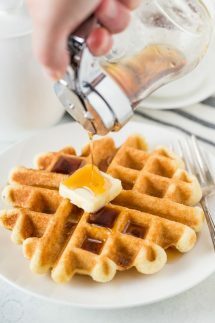 What’s the best low carb sweetener for low carb waffles? I think the best low carb granulated sweetener is Lakanto, they have a terrific taste compared to other low carb sweeteners, you can make a 1:1 substitute with regular sugar and it bakes up really nicely. I particularly love their blend of monkfruit and erythritol the best and I find that compared to stevia on its own this has a much more palatable flavor. 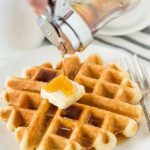 A Low Carb Keto Waffles recipe that is simple to make and without any fuss! Put all dry ingredients including the almond flour, baking powder (not baking soda) xanthan gum, and low carb granulated sweetener, in a bowl and mix well with a fork. In another bowl add all the wet ingredients, the eggs, water, and vanilla extract and mix well until combined. Pour half of the batter in to the middle of a hot, greased waffle iron. You may need to spread it out a little with a spatula. This amount will make approximately two waffles, though it depends on the size of the waffle iron. Close waffle iron and cook until it browns a bit, it took about 6 minutes in my waffle iron on a medium heat, but the timing may vary depending upon the heat of your waffle iron. 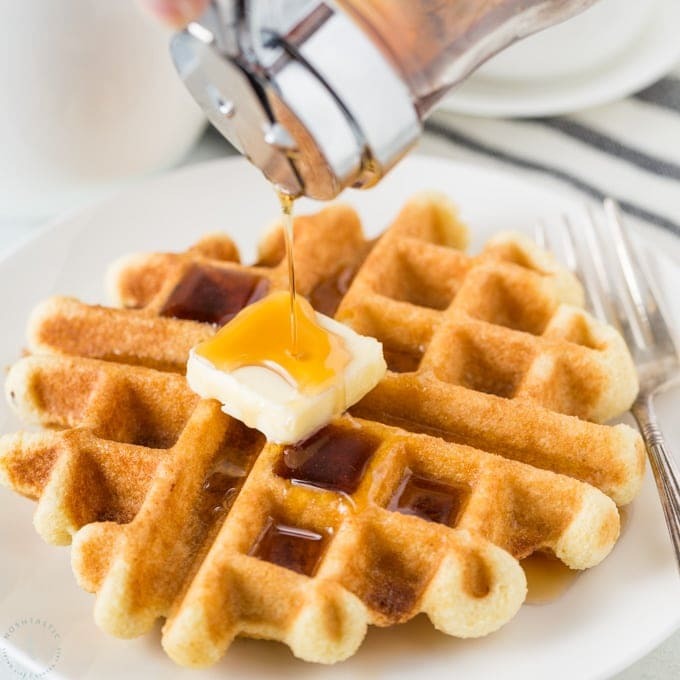 The waffles will be soft and fragile when cooked, they will firm up a little once they cool slightly but they will not become crispy like traditional waffles due to the almond flour. I love the taste of the granulated monkfruit/erythritol blends from Lakanto. I especially love the Golden Monkfruit 1:1 Sugar Substitute, it's the best tasting low carb sweetener I've tried and I highly recommend it for baking and anywhere you need to replace sugar in recipes. You can get a 20% discount with my link, just enter the code NOSHTASTIC at the checkout. 2g net carbs per serving/ per quarter waffle.